This elegant collection consists of intricate designs of birds and leaves. 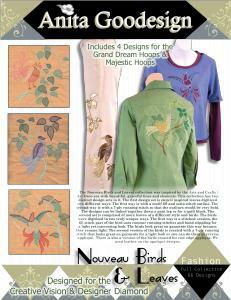 The designs show the beauty of birds in flight with their wings spread and their long, beautiful, tail feathers. The leaves have an open stitch design that gives them a light and airy feel, which makes these designs perfect for any garment. You can also go with a more trendy approach and use leather as your applique as we did on the long sleeve knit shirt. Knit and novelty fabrics work just as well for this applique technique. We used a technique called "reverse applique" on the blue and purple knit shirt. So, there are many options with the Nouveau Birds and Leaves collection. All these techniques are included in the Fashion workbook PDF file.